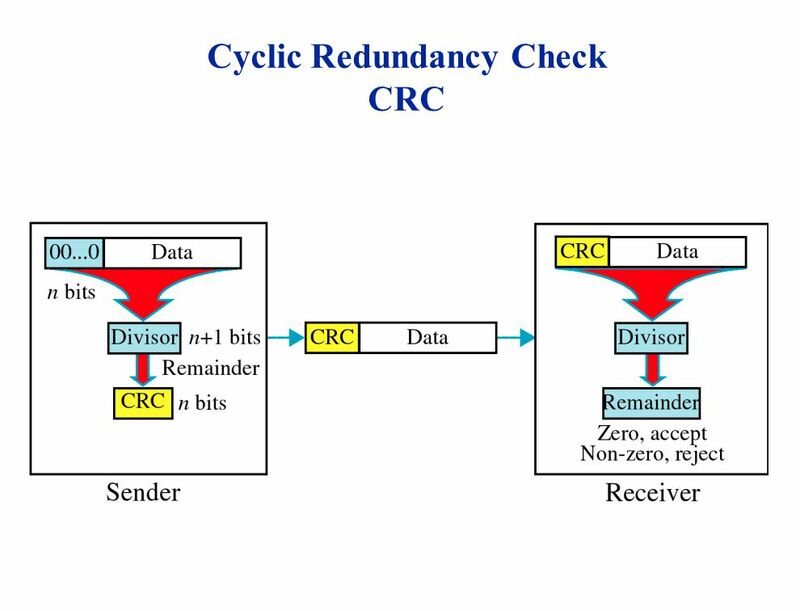 2 Basic concepts Networks must be able to transfer data from one device to another with complete accuracy. 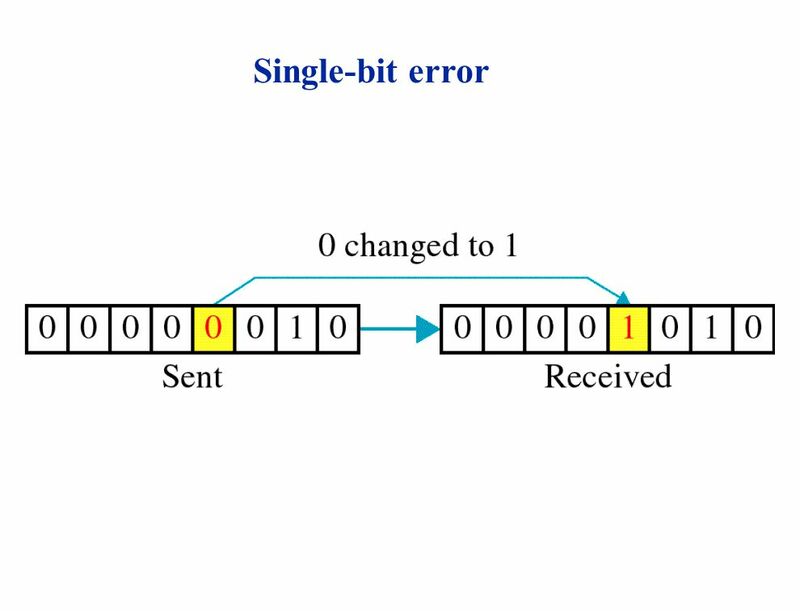 Data can be corrupted during transmission. 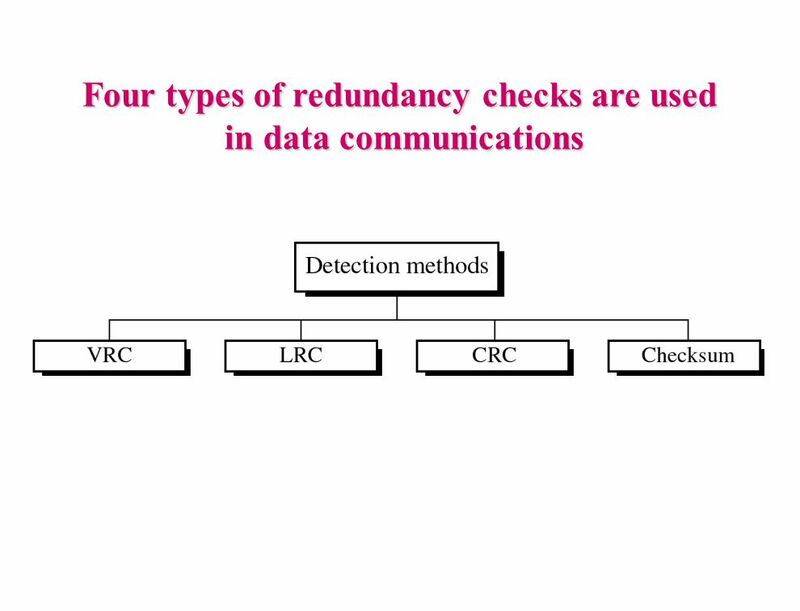 For reliable communication, errors must be detected and corrected. 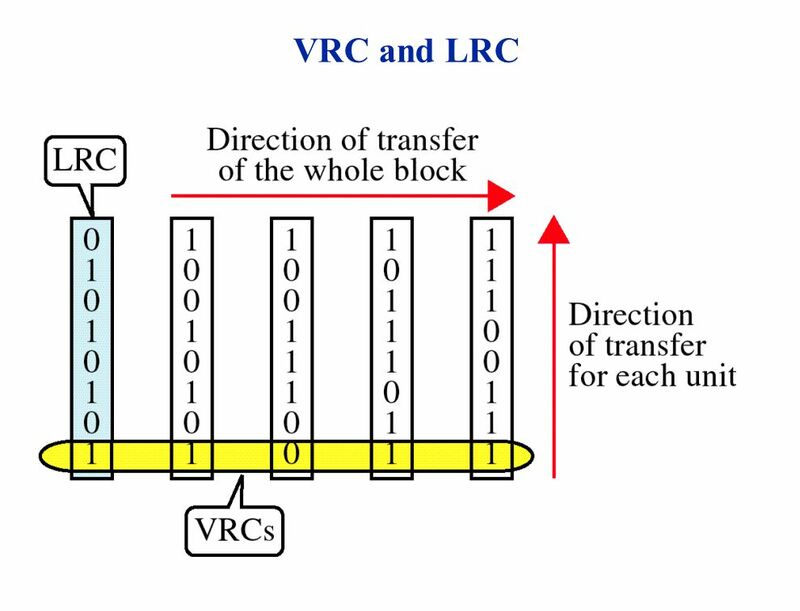 Error detection and correction are implemented either at the data link layer or the transport layer of the OSI model. 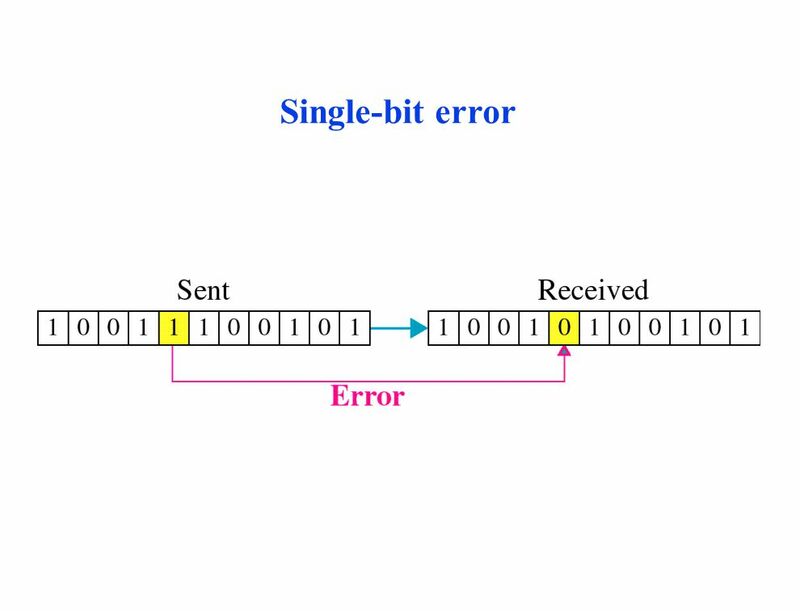 5 Single bit errors are the least likely type of errors in serial data transmission because the noise must have a very short duration which is very rare. 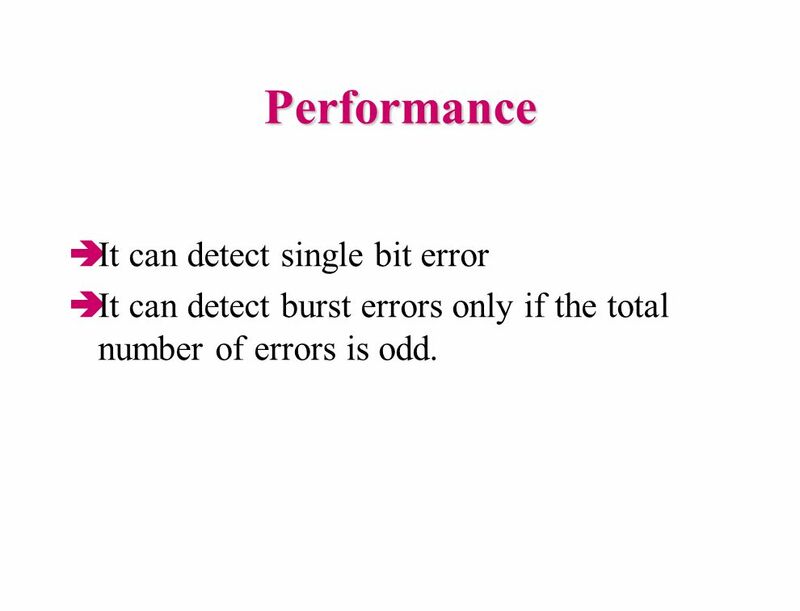 However this kind of errors can happen in parallel transmission. 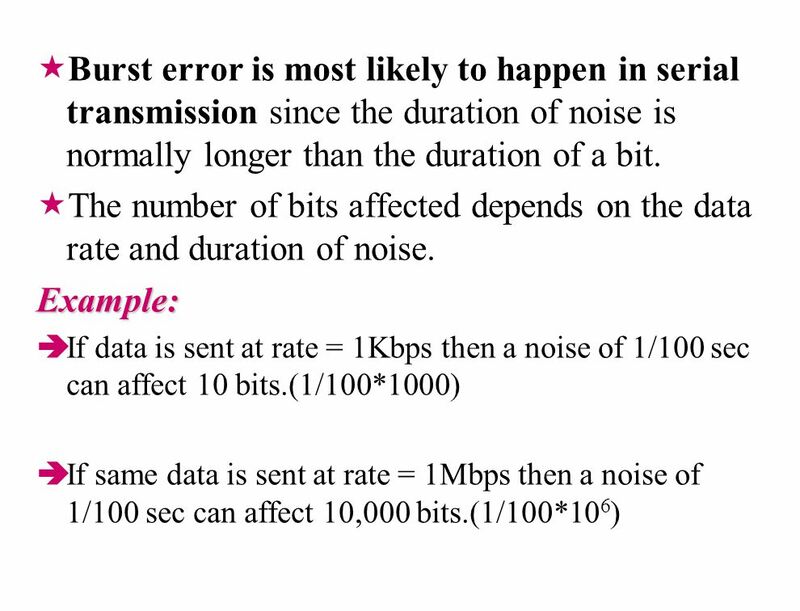 Example: If data is sent at 1Mbps then each bit lasts only 1/1,000,000 sec. 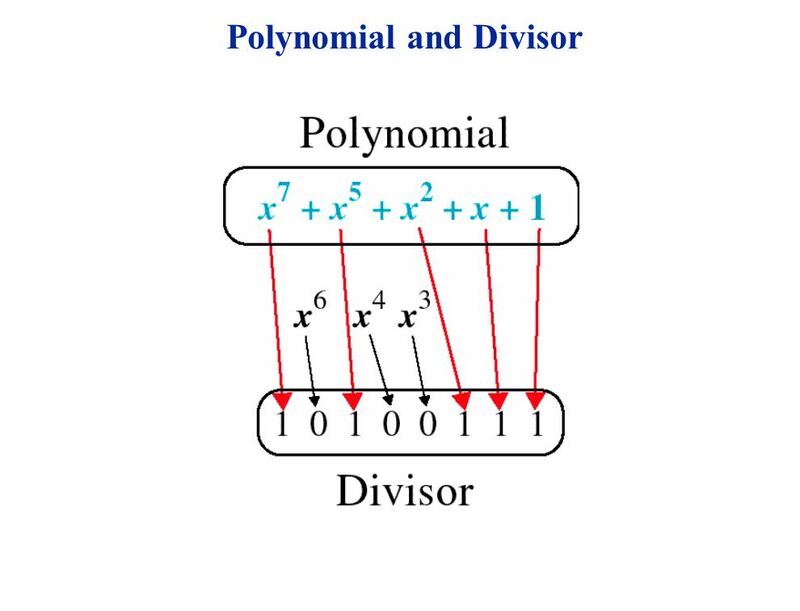 or 1 μs. 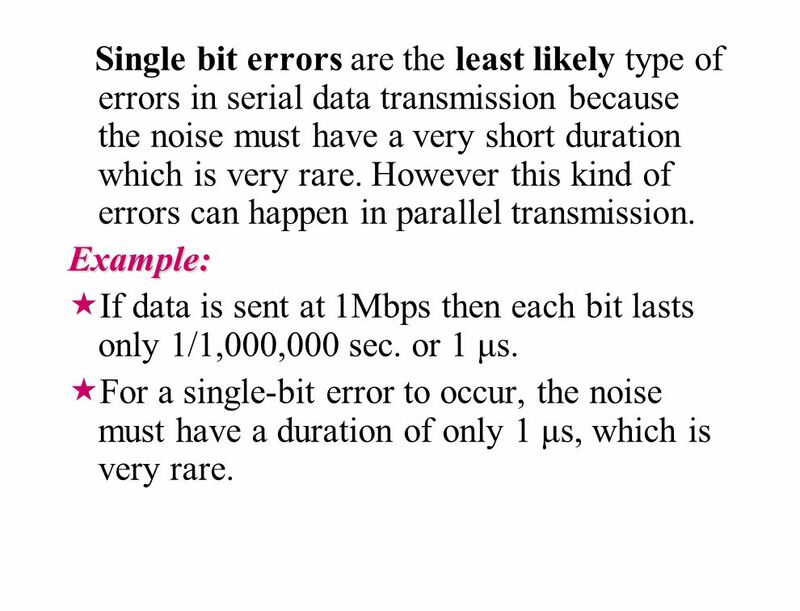 For a single-bit error to occur, the noise must have a duration of only 1 μs, which is very rare. 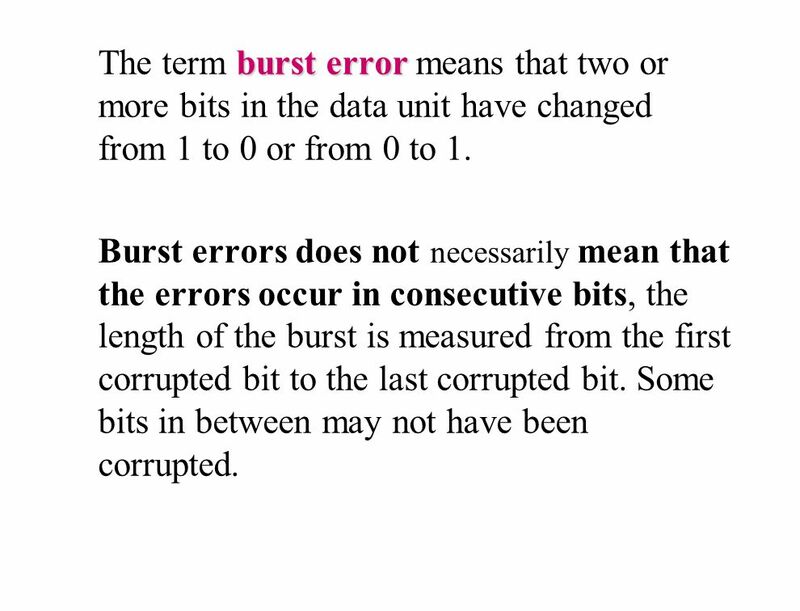 8 The term burst error means that two or more bits in the data unit have changed from 1 to 0 or from 0 to 1. 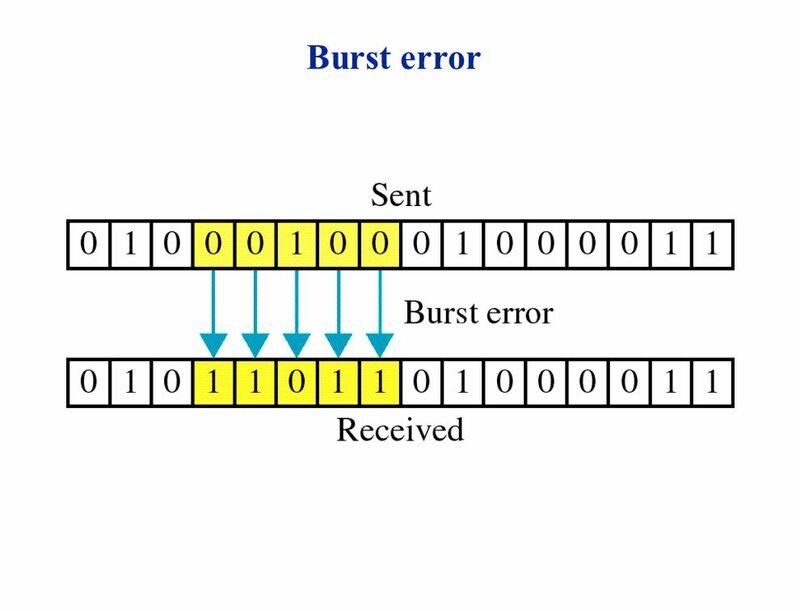 Burst errors does not necessarily mean that the errors occur in consecutive bits, the length of the burst is measured from the first corrupted bit to the last corrupted bit. Some bits in between may not have been corrupted. 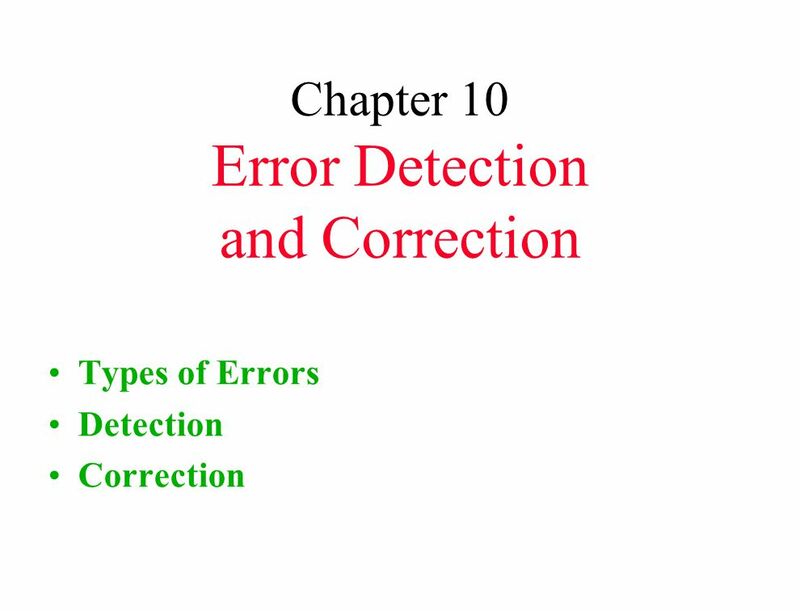 10 Error detection Error detection means to decide whether the received data is correct or not without having a copy of the original message. 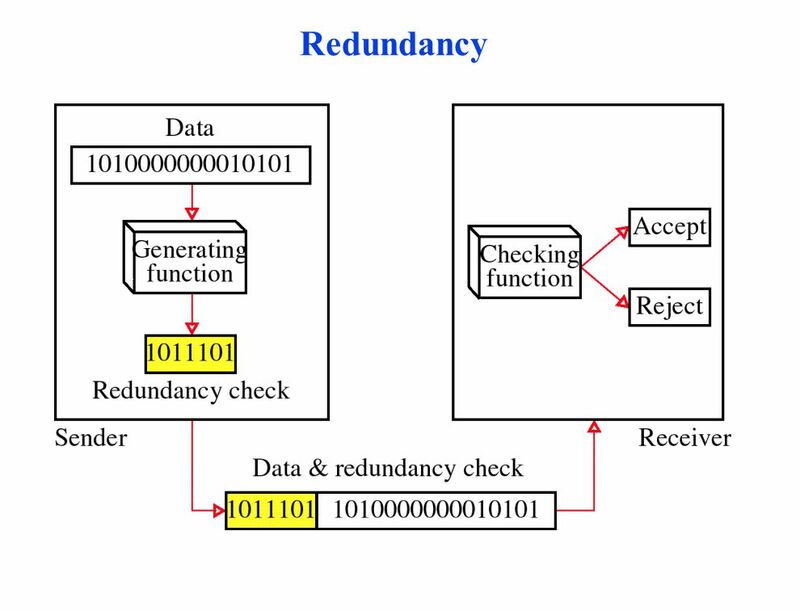 Error detection uses the concept of redundancy, which means adding extra bits for detecting errors at the destination. Make sense of message. 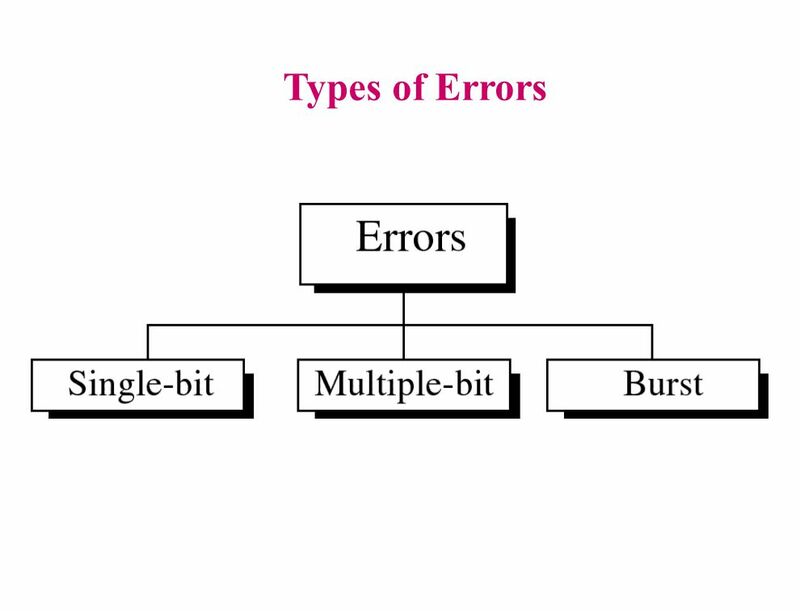 It can detect burst errors only if the total number of errors is odd. 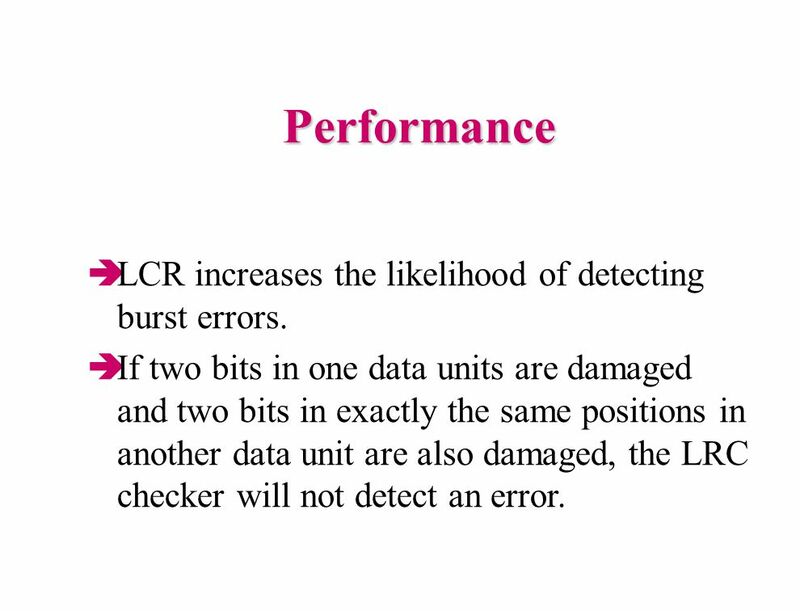 16 Performance LCR increases the likelihood of detecting burst errors. 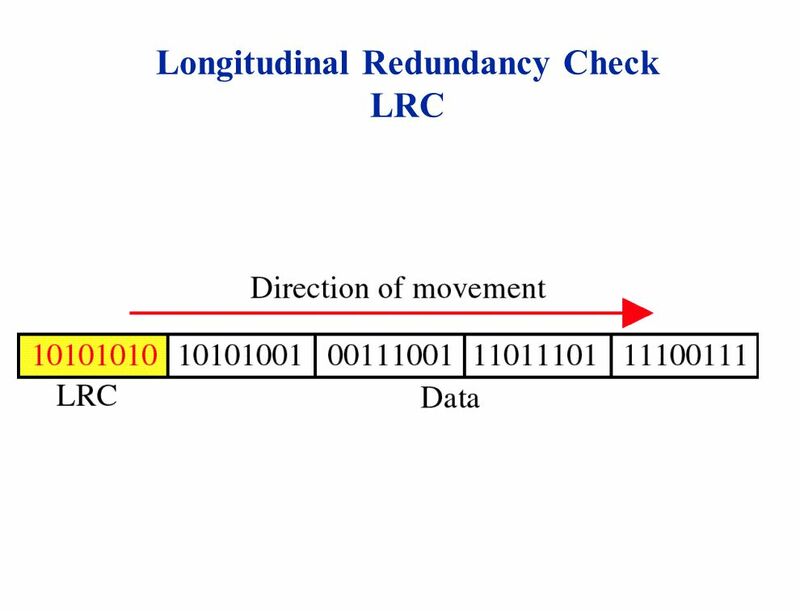 If two bits in one data units are damaged and two bits in exactly the same positions in another data unit are also damaged, the LRC checker will not detect an error. 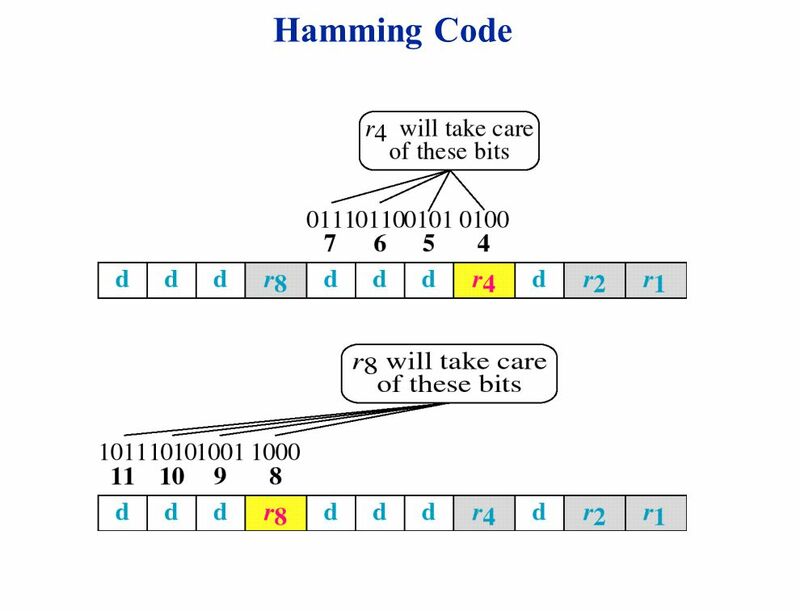 Given a k-bit frame or message, the transmitter generates an n-bit sequence, known as a frame check sequence (FCS), so that the resulting frame, consisting of (k+n) bits, is exactly divisible by some predetermined number. 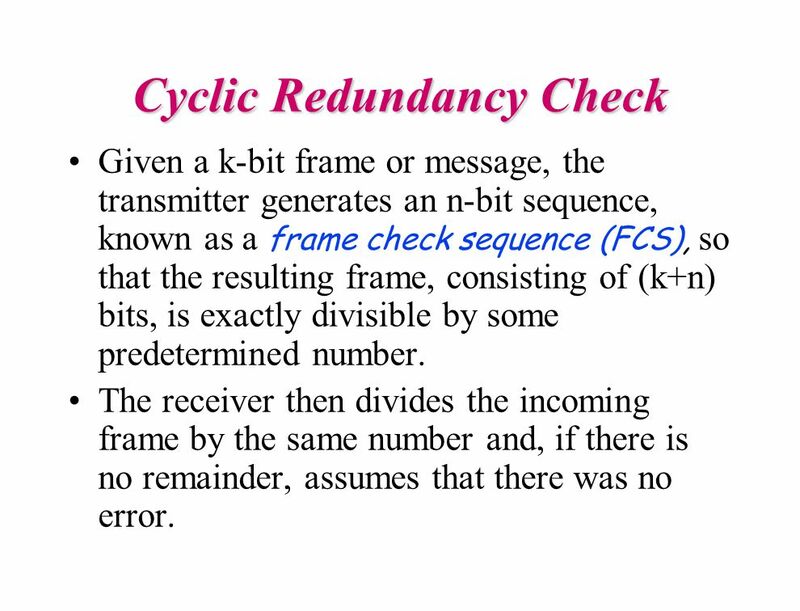 The receiver then divides the incoming frame by the same number and, if there is no remainder, assumes that there was no error. 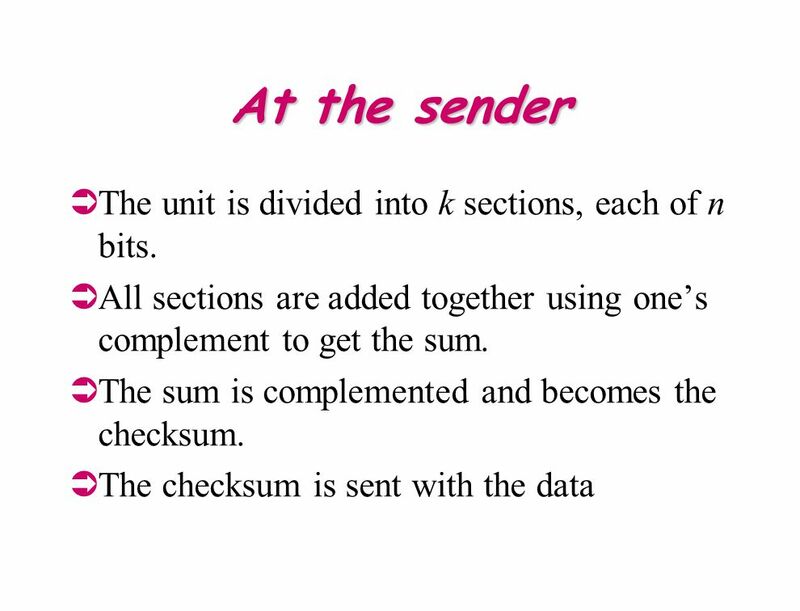 25 At the sender The unit is divided into k sections, each of n bits. 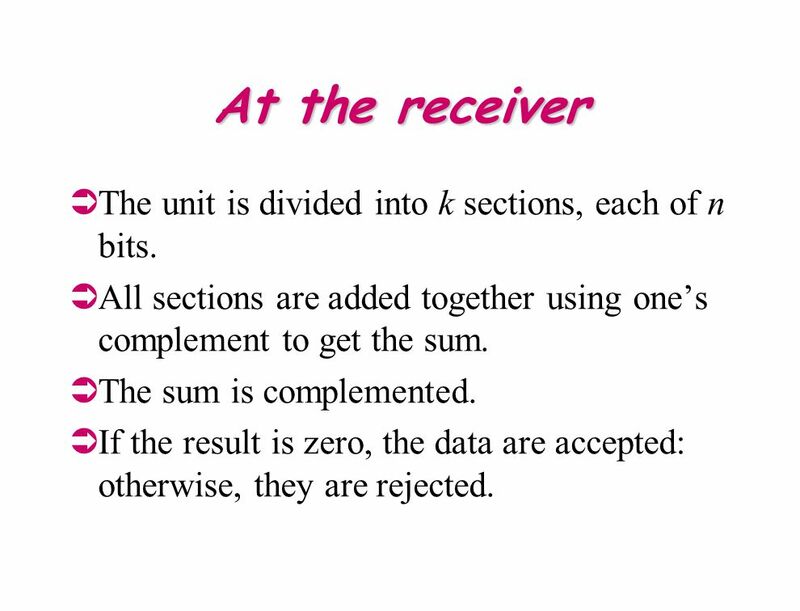 26 At the receiver The unit is divided into k sections, each of n bits. 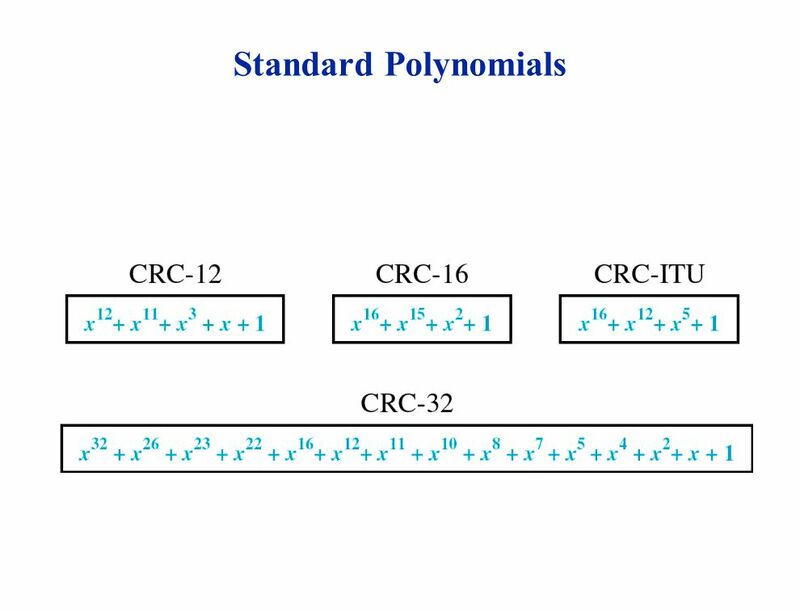 All sections are added together using one’s complement to get the sum. 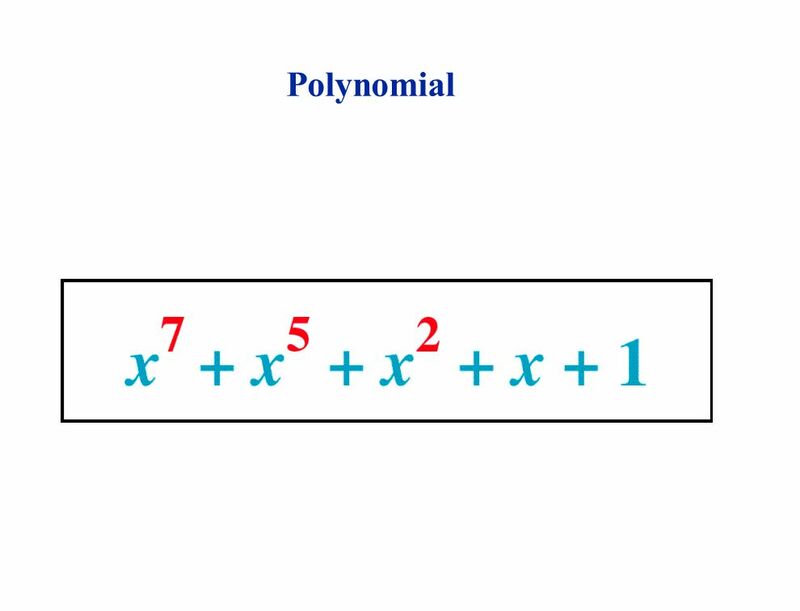 The sum is complemented. 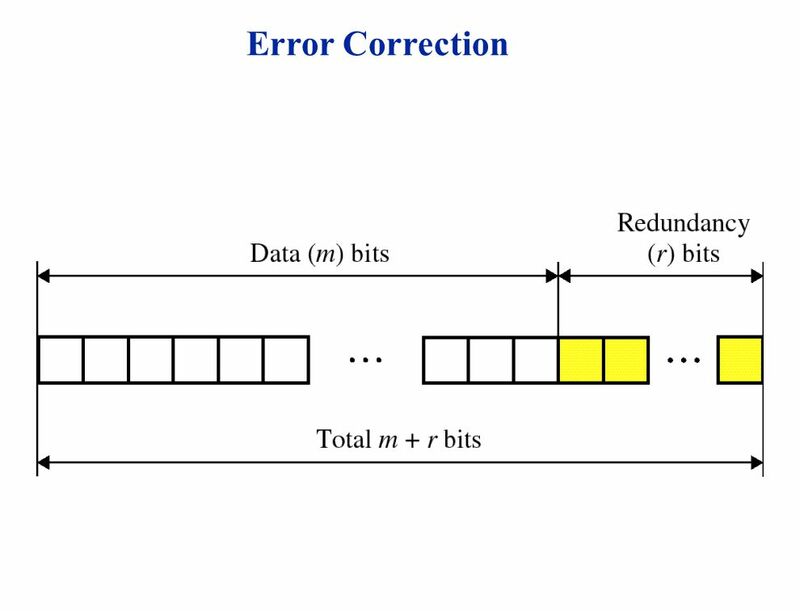 If the result is zero, the data are accepted: otherwise, they are rejected. 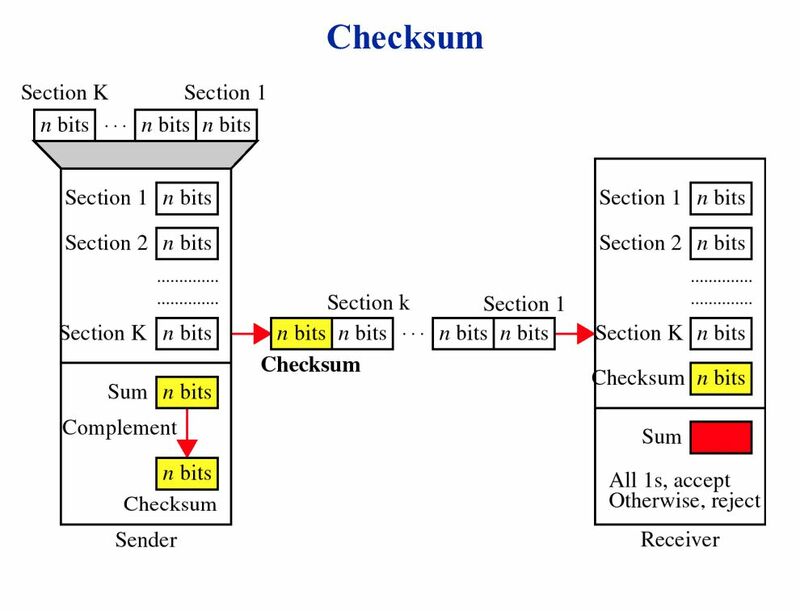 27 Performance The checksum detects all errors involving an odd number of bits. 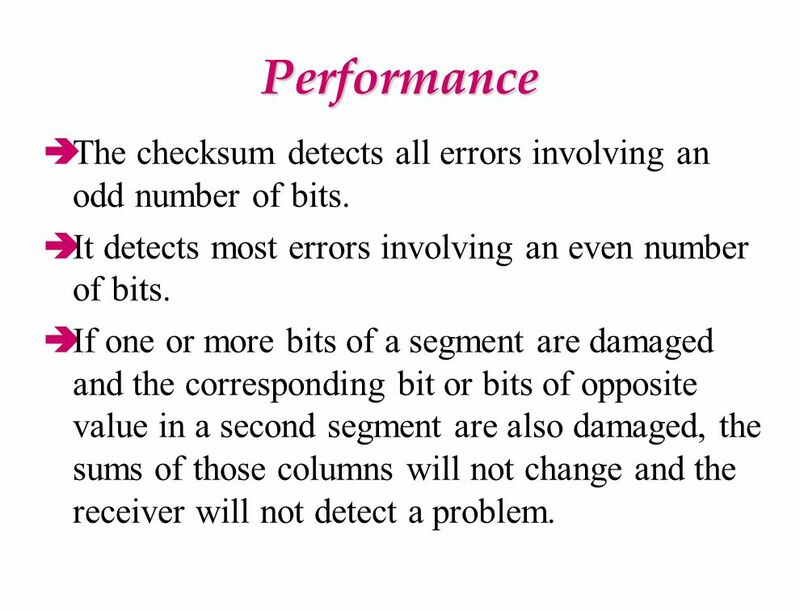 It detects most errors involving an even number of bits. 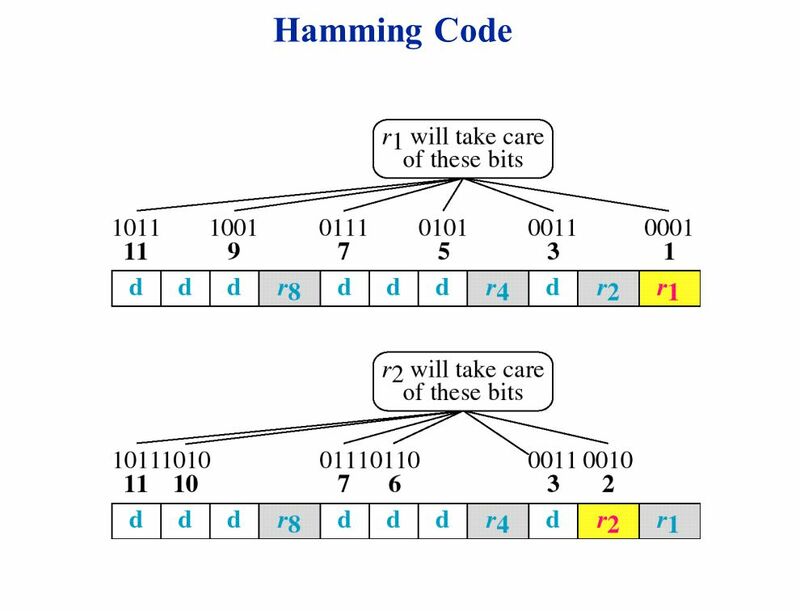 If one or more bits of a segment are damaged and the corresponding bit or bits of opposite value in a second segment are also damaged, the sums of those columns will not change and the receiver will not detect a problem. 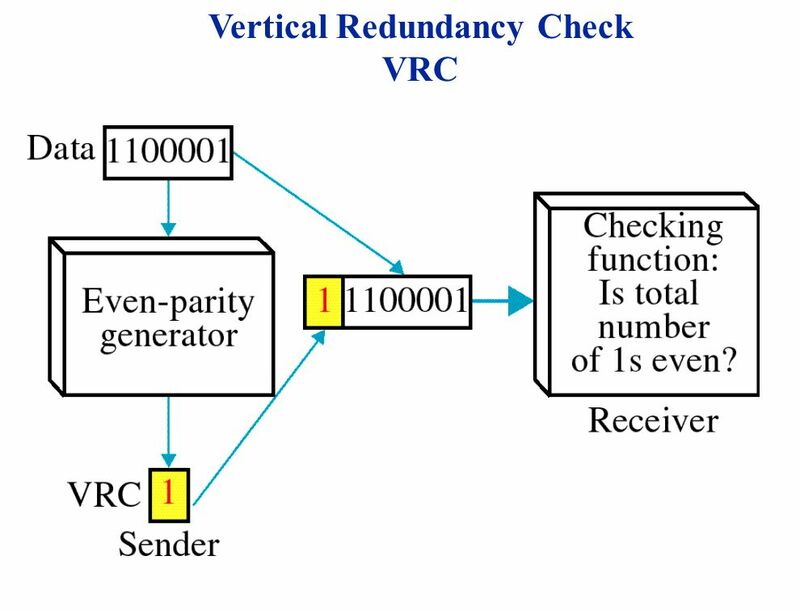 receiver can have the sender retransmit the entire data unit. 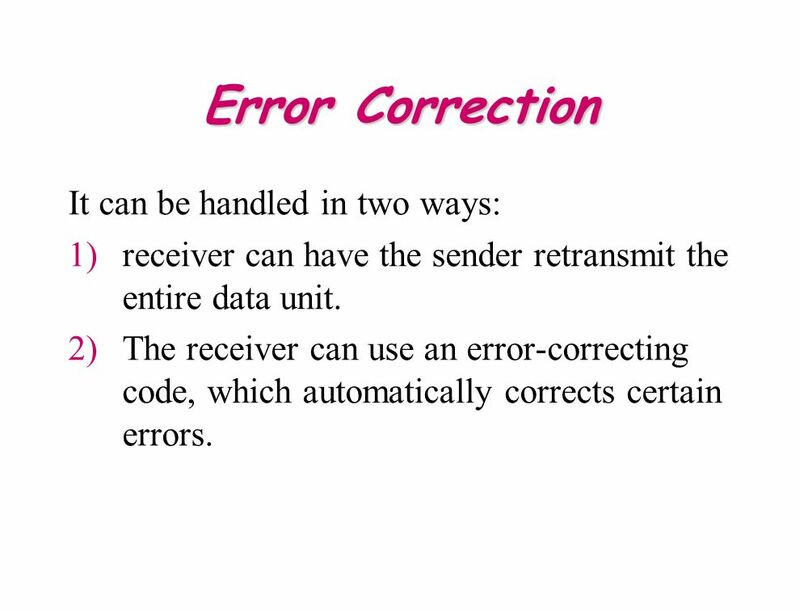 The receiver can use an error-correcting code, which automatically corrects certain errors. 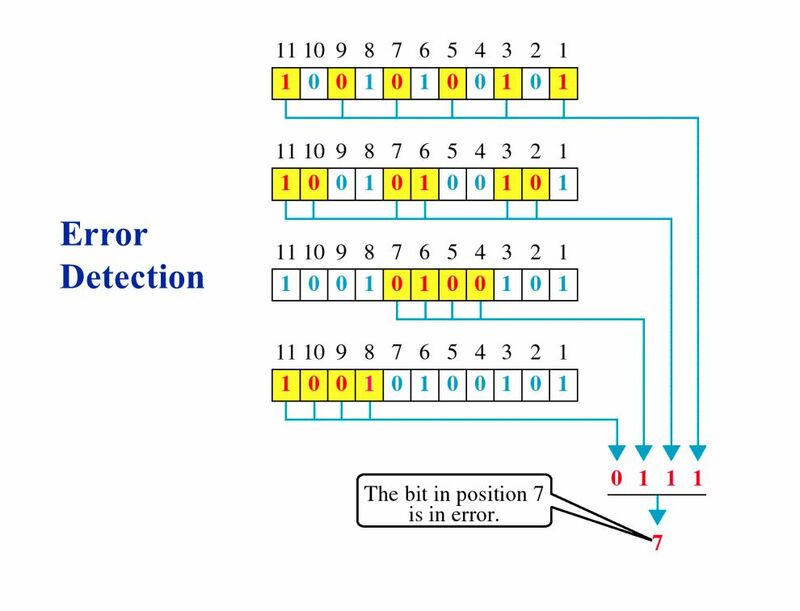 Download ppt "Chapter 10 Error Detection and Correction"
NETWORKING CONCEPTS. 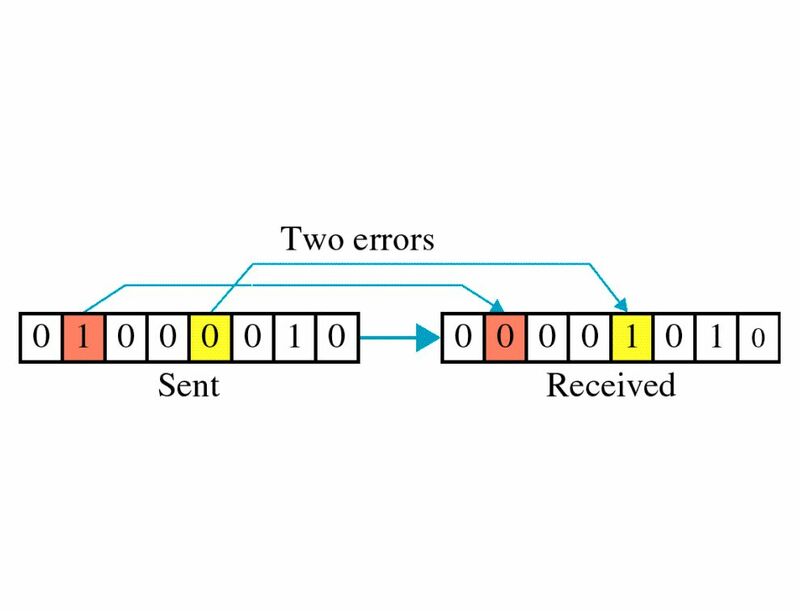 ERROR DETECTION Error occures when a bit is altered between transmission& reception ie. 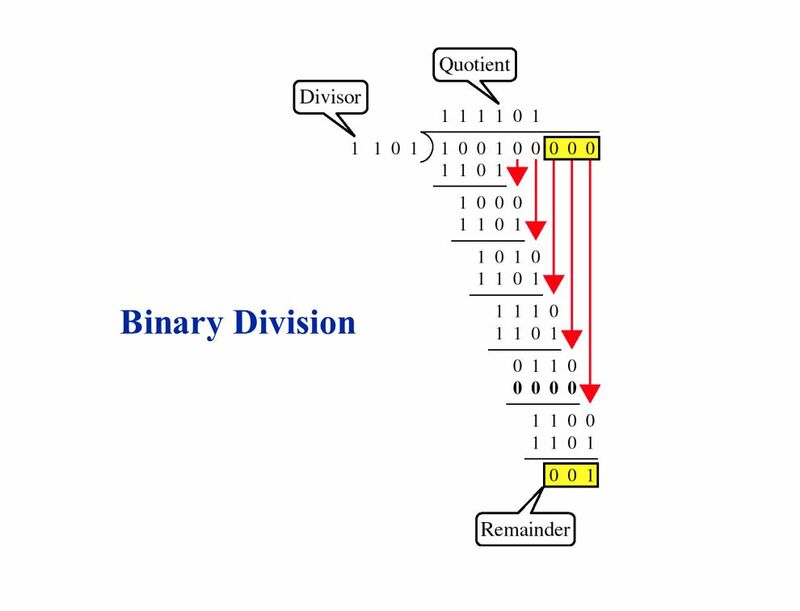 Binary 1 is transmitted but received is binary. 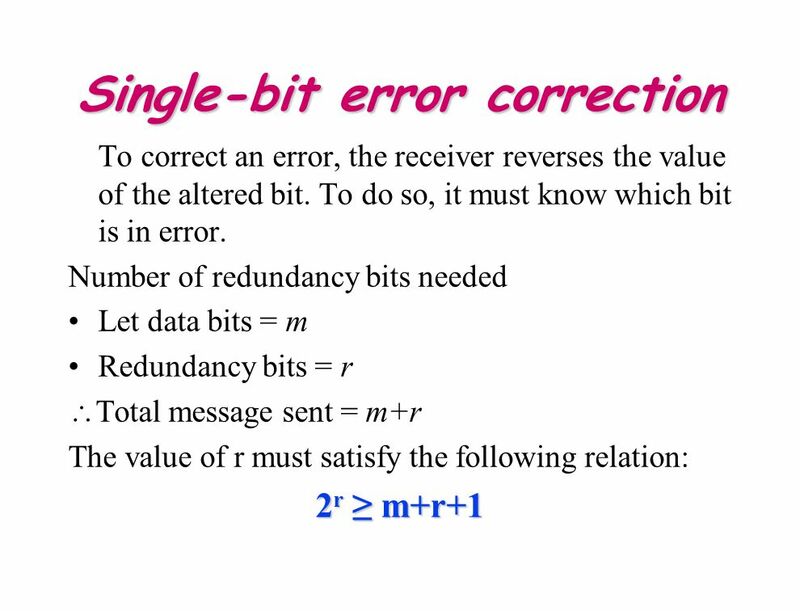 Fundamentals of Computer Networks ECE 478/578 Lecture #4: Error Detection and Correction Instructor: Loukas Lazos Dept of Electrical and Computer Engineering. 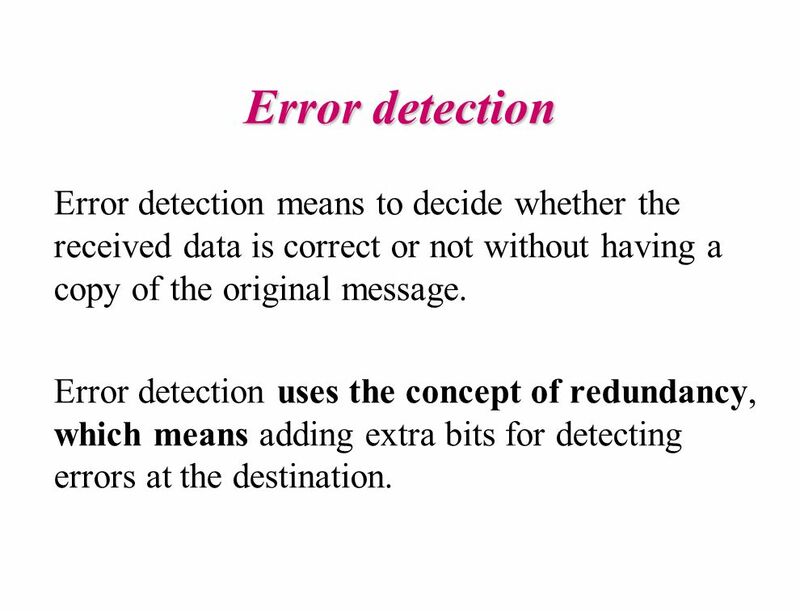 Error Detection and Correction Rizwan Rehman Centre for Computer Studies Dibrugarh University. 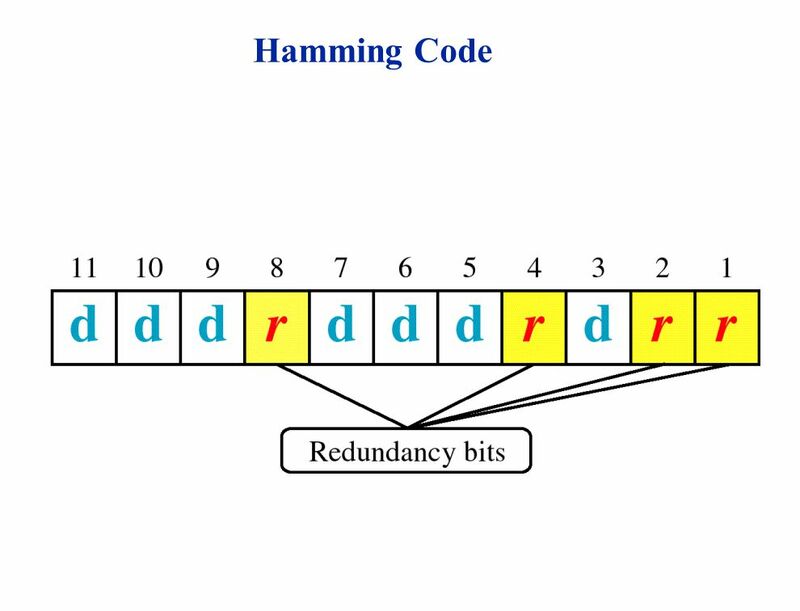 Hamming Code Rachel Ah Chuen. 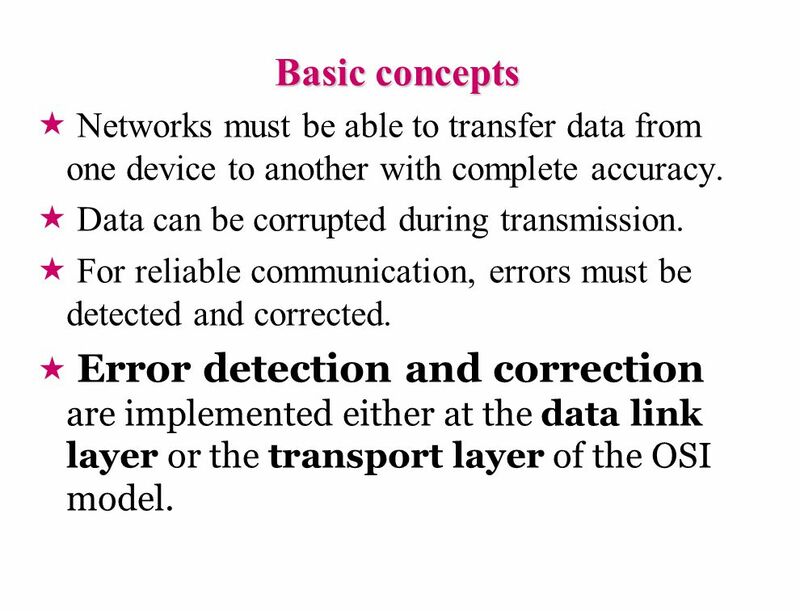 Basic concepts Networks must be able to transfer data from one device to another with complete accuracy. 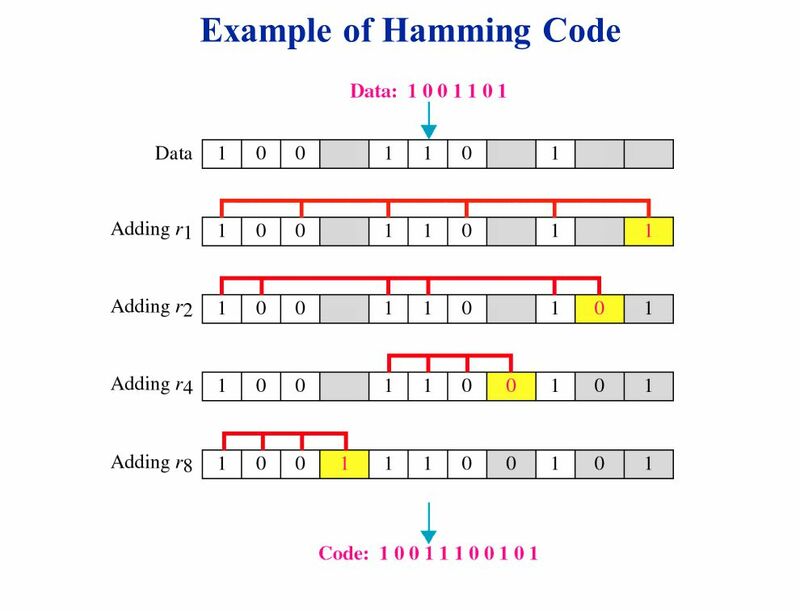 Data can be corrupted. COMPUTER NETWORKS Ms. Mrinmoyee Mukherjee Assistant Professor St. Francis Institute of Technology, Mount Poinsur, S.V.P Road, Borivli (west), Mumbai- 400103.